When Paul asked a congregation to read his letter to everyone, what kind of script did he provide? What did the manuscript look like? What did early Christians use when they read texts during their worship services? Thus begins David Trobish’s exploration into the “Oral Performance of Biblical Texts in the Early Church,” published in the Fall 2011 Concordia Journal, due out at the beginning of November. The title may sound esoteric, but the implications are anything but. Trobisch invites us to think more deeply about why (and how) we read the scriptures aloud within a community of people, an act which—last time I checked—was done more than a few times every week at thousands upon thousands of Christian congregations throughout the world. To inquire about the “real” or authoritative text of the Book of Concord is to ask questions in ways that were hardly conceivable in the time of its origins. This anachronistic query reflects the ways in which technological developments form our presuppositions and shape our concerns. It reveals our presumptions that arise from our ability to distribute texts through very recent developments in typography and by electronic means in thousand- and million-fold copies that are exactly the same. The technology of the first centuries of the Gutenberg era was not so advanced. Our search for a precise, “authentic” text also reveals a bit of the need for security, secure knowledge, that marks our thinking in a society ever more hostile to the Christian faith and to the very concept of truth. At the heart of Kolb’s theological investigation—supported, as always, by impeccable historical research—is the sometimes tense and always diverse relationships between form and content, technology and text, that form our sense of “authority” and how authority shapes belief. Kolb’s work is further supported by the extensive bibliography of the printings of the 1580 Dresden Book of Concord from Thomas Von Hagel, professor of theology at Concordia University, Chicago. 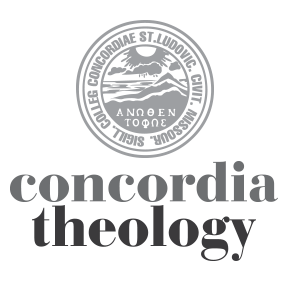 The Fall 2011 Concordia Journal also features Erik Herrmann’s reflection on the word diakonia, the first of a three-part series of theological observers on LCMS President Matt Harrison’s three-part emphasis for the church. And Eric Andrae provides a comprehensive review of Dietrich Bonhoeffer Works, the 16-volume set that is now coming to completion, representing a new era in Bonhoeffer studies. All of this in addition to what you usually expect from Concordia Journal…preaching helps, book reviews, a word from President Dale Meyer, etc…your quarterly dose of theological vitamins to last you through Advent, Christmas, and the dead of winter. Since the Fall CJ issue hasn’t arrived yet, I’m looking for Homiletical Helps for this coming Sunday, Nov. 13th ff. Help! Thanks — the hom help for this Sunday has already been posted. Go to the navigation bar at the top of the page and click on “The Pulpit.” Then, click on either “Homiletical Helps” or “Lectionary at Lunch+” You’ll find the Nov 13 hom helps in both locations. The rest of the Hom Helps for the Fall 2011 issue will be posted in the coming days.